Chulu West (6,584m) is situated above the Manang valley with breathtaking views across to the Annapurna II, III and IV, Gangapurna, Glacier Dome, Dhaulagiri, Tilicho Peak and Manaslu. The climb is combined with the classic trek around the Annapurna massif, ascending the Marshyangdi valley and crossing the Thorong La, before descending the Kali Gandaki valley to Pokhara. The climb is technically straightforward and you should be familiar with the use of your equipment, crampons, harness, ice axe, tying knots and handling climbing ropes. Most of the climbing will be involved walking roped together, including the glacial crossings. You should be very fit and have good experience of climbing. The north-east ridge is considered the normal route to climb the peak from the Base Camp on the moraine at 5,334m (17500ft). Most of the climbers make it to the top and back from the Base Camp in a long day. Although some in the past have established a higher camp somewhere below the peak. Another subsidiary peak called Chulu Far East (6,059m) (19880ft) may also be attempted from this approach. 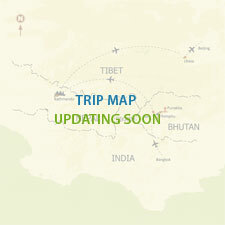 Day 13: Fly or drive to Kathmandu. Farewell dinner.